I was going going through my classroom closet the other day. You might have a space like that, too, where years of curriculum and resources get shoved. I can’t seem to throw much of it away, or give it away, but I also don’t use it anymore because of shifts in my teaching and curriculum and standards. So, in the closet it goes in hopes that it might still have some use some day. Yesterday, I was digging around for a Dr. Seuss book (following up on our World Read Aloud Day activity of using The Butter Battle Book for a lesson on allegory) when I saw a flash of green in the way back. I reached in and pulled out … my old XO computer. Do you remember these? 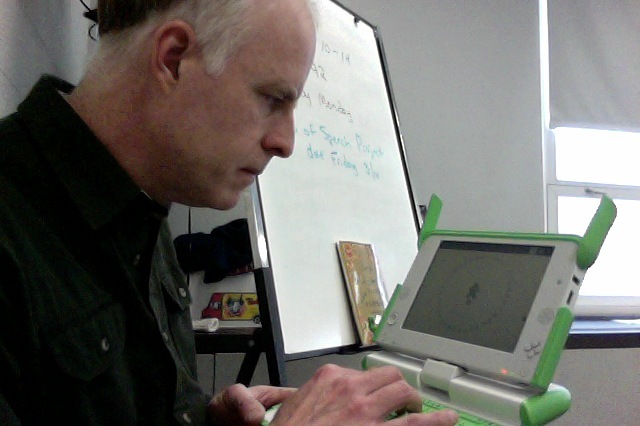 This little green machines launched the netbook push, although it was an experiment to build affordable computers for use in education around the world by the One Laptop Per Child organization (which wanted to build $100 computers). I paid for two XOs at the time, and received one for myself. The other XO was part of a shipment to some corner of the world, hopefully finding its way into the hands of students. The XO was always quirky, particularly this first-generation model. So I didn’t know if it would even boot up for me. It did, and I was again interested in the design of the software interface (it uses an open source platform called Sugar) and how child-friendly it is. That’s when I realized that I could use the XO for the day’s Daily Create assignment, which had to do with creating a video in ventriloquist theme, promoting DS106 (an open online digital storytelling movement). There is a program that allows you to type in words and it says them in a voice back to you (when I opened the app, it called out “Welcome Kevin” as if it and I were best of friends and I had only gone out for a cup of coffee, not unplugged it for about three years). You never know what you will find in the back of a classroom closet, do you? This is an interesting video from the TED conference network on the XO Computer initiative. Nicholas Negroponte is very engaging in explaining how the XO laptops can be integrated into developing communities in ways that bring children into the spotlight. I was playing around with my XO again yesterday because I set up a wireless system in my house (finally) and wanted to get it connected. It took a bit of figuring out, but when I was up and running, I did my first cross-country chat with another XO person (Mark) on the west coast. It was so easy and simple. Here are two very neat animations developed by students to explain two features of the XO Laptop. These come from the Nortel Learn-It program and the videos were created by high school students. This librarian, Robin, has created a very nice intro video about the XO laptop computer. She is very thorough and clear in her explanations, which is always welcome in the world in which I live. She’s lucky to have other XO users near her, of course. My neighborhood view is awfully empty. I’ve been exploring my XO computer as an eReader, although I didn’t quite know how to begin. Then, I found this very cool (free) eBook site called WOWIO that has a growing list of free titles for registered users (the collection does not seem to include many new novels, etc, and the selection is kind of iffy at this point). But I have been checking out a few graphic novels from the site on my XO. I like the eReader mechanism on the XO. The lighting is nice, the resolution is pretty good, and the ability to swivel the screen to multiple positions is pretty nifty. Plus, the entire laptop is very light and easy to hold and balance on your lap or stomach (if you are reading while in the sleepy prone position). My sons were getting a kick out of reading some comic strips (Peanuts, Garfield, etc) that I downloaded as a comic book collection from the WOWIO site. I have also added a Beowulf graphic novel, and a book about myths from around the world, and a few other odds and ends into my Queue bin (you can only download three books a day). 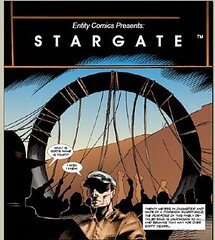 Right now, I am reading a Stargate graphic novel (I have a sci-fi interest). My friend, Bud the Teacher, created a nice podcast reflection on using the XO for collaboration. He used a site that has been set up by Tom Hoffman for XO folks to connect and use the sharing activities with others. He gives some honest assessment of the possibilities and the limitations, and of course, he is very insightful in his approach (as always). And Bud’s post makes me want to use the Jabber site he mentions to try to connect in with some other XO folks.